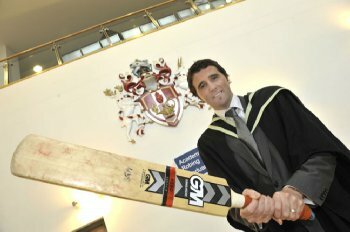 Kyle McCallan MBE, who today was made First Trust Bank/University of Ulster Distinguished Graduate of the Year, has had a long and distinguished career as an Irish senior international cricketer. He is a right-handed batsman and off spin bowler. Kyle – who graduated in BA Sports Studies 1998, and received his in PGCE 2001 – has represented Ulster (Northern Cricket Union) and Ireland at every age group level, from under 13 to senior international level. He has been capped more times by the Ireland senior cricket team than any other player in history. Following his debut in 1996, he went on to represent Ireland in the 1998 Commonwealth Games and the 2000, 2002 and 2004 European Championships, captaining the team during the Championships in 2000. The highlight of his career, however, was representing Ireland at the 2007 Cricket World Cup in the West Indies in which Ireland qualified for the Super 8 stage – beating Pakistan and Bangladesh along the way – to finish in eighth place in a 16-team tournament. Kyle was an integral part of the team and played in all the matches in the World Cup and in all of Ireland's one day international matches until he retired. Kyle also played in the T20 World Cup in England in 2009, again reaching the Super 8 stage. As a student, Kyle captained the University team to victory in the Irish University Cricket competition. He also represented the University in rugby and played in the annual Colours Match against QUB. Kyle was the recipient of the University’s Performance Sports Scholarship for the duration of his studies. He announced his retirement from international cricket in December 2009, after a record 226 caps. He also captained Ireland a record 54 times. Kyle is a teacher at Grosvenor Grammar School and was awarded an MBE in the 2010 Birthday Honours List for services to cricket in Northern Ireland.